Sedum aurora growing subshrub succulent of the genus Sedum also known as Sedum rubrotinctum, Sedum aurora perennial evergreen used as ornamental drought tolerant plant, can grow in mediterranean, desert, subtropics climate or as houseplant and growing in hardiness zone 9-11. Leaves color light green to red, orange or pink the leaf is fleshy oval shape grow in rosette shape. 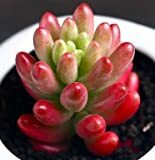 Beautiful Succulent, Sedum Aurora beautiful jelly bean plant. Succulent plant, Sedum Aurora. Forms small shrubby plant with stems that are erect at first and become decumbent with time. Succulent plant, Sedum Aurora. Beautifully colored sedum forms small shrubby plant with stems that are erect at first. Succulent plant, Sedum Aurora is a really cute plant.